The Colorescience All Calm Corrective Kit has been carefully curated to protect, correct and soothe your skin. The color corrector, sunscreen and setting spray work in synergy to replenish and safeguard the complexion while locking makeup in place for a flawless finish. A 3-in-1 proprietary formula that helps to neutralize redness while soothing and protecting sensitive skin. The moisturizing color corrector has a subtle green undertone to help counteract redness, and is fortified with a non-chemical, mineral SPF for broad spectrum UVA/UVB protection. Calming and relieving signs of redness and sensitivity, the clinically-tested formula contains a patent-pending BioSolace™ complex for ongoing relief. A color corrector and sunscreen all in one, it will leave skin looking balanced and feeling comfortable. Free from gluten and parabens. Non-comedogenic. A water-resistant* all-mineral sunscreen with integrated brush for easy application on-the-go. Fortified with EnviroScreen™ Technology, the broad spectrum sunscreen powder expertly protects against UV rays, pollution, blue light and infrared radiation while providing a hint of sheer coverage. Laying down an invisible daily defense, the protective shield is hydrating and packed with antioxidants, leaving skin totally protected and comfortable. The brush is made with antimicrobial bristles to maintain brush freshness. Can be worn alone or over makeup. Hypoallergenic and non-comedogenic. *Water-resistant for 80 minutes. A soothing setting spray that calms and nourishes skin while prolonging mineral makeup wear. Helping to calm and replenish normal to dry skin, the revitalizing mist is formulated with D20 Heavy Water for increased hydration, plus Ylang Ylang and Chamomile botanical oils for a soothing effect. Delivering a fine mist onto skin, it locks in makeup while enhancing radiance. Free from gluten and parabens. Apply 1-2 pumps of All Calm Clinical Redness Corrector to lightly moisturized skin as the first step in your makeup application. The subtle green undertones will instantly neutralize and balance redness. Follow with Sunforgettable Brush-on Sunscreen for complete broad spectrum UVA/UVB protection. Reapply every two hours. 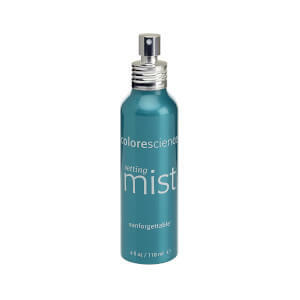 Finish with Hydrating Setting Mist to refresh skin, lock in makeup, and revitalize your complexion throughout the day. Redness Corrector: Active Ingredients: Titanium Dioxide 11.6%; Zinc Oxide 8.6%. Inactive Ingredients: Cyclopentasiloxane, Caprylic/Capric Triglyceride, Water/Aqua/Eau, Dimethicone Crosspolymer, Niacinamide, Disteardimonium Hectorite, Dimethicone/Vinyl Dimethicone Crosspolymer, Propylene Carbonate, Disodium Lauriminodipropionate Tocopheryl Phosphates, Crithmum Maritimum Extract, Magnolia Officinalis Bark Extract, Zingiber Officinale (Ginger) Root Extract, Magnesium Carboxymethyl Beta-Glucan, Jojoba Esters, Bisabolol, Silica, Polyhydroxystearic Acid, Dimethiconol, Alumina, Glyceryl Behenate/Eicosadioate, Phenoxyethanol, Triethoxycaprylylsilane, Ethylhexylglycerin, Tocopherol, Dehydroacetic Acid, Benzoic Acid, Glycolic Acid, Chloroacetic Acid, Chromium Oxide Greens (CI 77288), Iron Oxides (CI 77491, CI 77492, CI 77499). Setting Mist: Chamomilla Recutita (Matricaria) Flower Water, Cananga Odorata (Ylang Ylang) Flower Water, Water/Aqua/Eau, Citric Acid, Potassium Sorbate, Sodium Benzoate, Benzyl Salicylate, Farnesol, Geraniol, Limonene, Linalool.